If words are unclear you need Magic Ear by Atomic beam the discreet sound booster that looks like a pocket radio. Magic Ears adds a boost to your hearing, so you can hear voices up to 100 feet away. 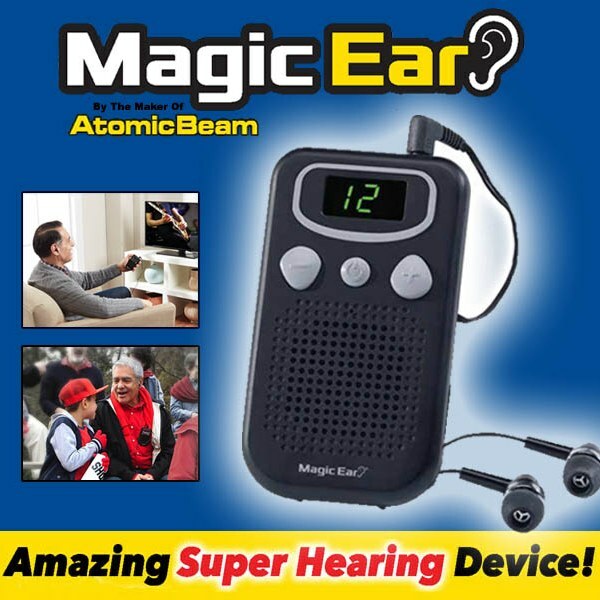 Magic Ear personal sound booster gives you super hearing instantly. Feature new technology that enhances vocals while canceling background noise. You&apos;ll hear so well you&apos;ll be able to hear a whisper from 100 feet away. Tune out distracting chatter at the movies and hear every word spoken in the movie. Easily turn your noisy environment into a noise- free environment. Features Large LCD screen, 15 different volume levels, comfortable earbuds and easy on/off. Great to enhance sound while watching TV or movie, dinning in noise restaurant or just enjoying talking with friends. You&apos;ll never miss a word again.